For many people, rice is often the go-to side for a curry. 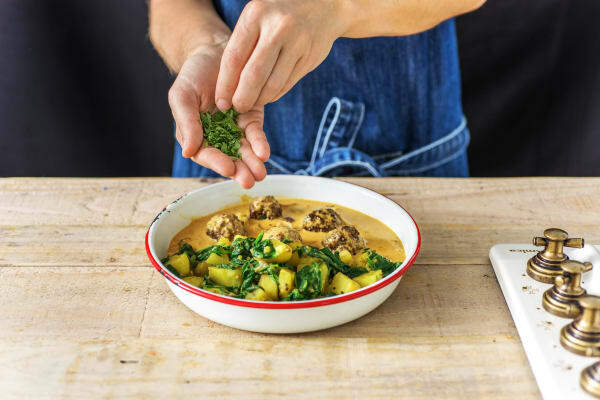 We’ve decided to serve our aromatic beef kofta curry alongside sag aloo, a nutritious dish of spinach, potato and fragrant spices, which gives rice a serious run for its money. Easy to prep, and even easier to eat, this is a curry you’ll be coming back to time and time again. Halve, peel and chop the red onion into roughly 2cm pieces. Peel and grate the garlic (or use a garlic press). 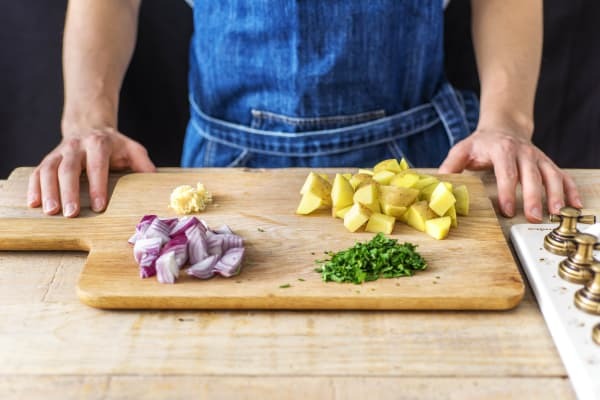 Chop the potato (no need to peel!) into 2cm cubes. Roughly chop the coriander (stalks and all). Put a splash of oil in a large saucepan on medium heat. Add the onion and cook until soft, 5 mins. Add the garlic, stir and cook for 1 minute more. Then take out half of this mixture and set aside in a bowl or on a plate. Add the ground cumin, turmeric and mustard seeds to the remaining onion in the pan and stir continuously for 1 minute. Add the potato and water (amount specified in the ingredient list) and half the chicken stock pot. Stir to dissolve the stock pot. Cover with a lid, turn the heat to low and simmer until the potato is just cooked, 15-20 mins. TIP: The potato is cooked when you can easily slip a knife through. Meanwhile, put the beef mince in a mixing bowl with a pinch of salt, a good grind of black pepper and half the coriander. Mix it all together. TIP: The best way of doing this is by using your hands! Shape the beef mixture into four little balls per person. Heat a splash of oil in a frying pan and fry, stirring occasionally, until browned all over and cooked through, 10-12 mins. 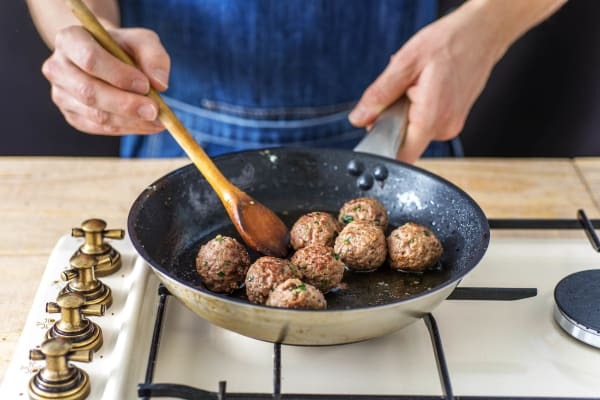 Take the koftas out of the pan and set aside. Add the reserved onion mixture to the same pan (no need to wash it) along with the tandoori paste. 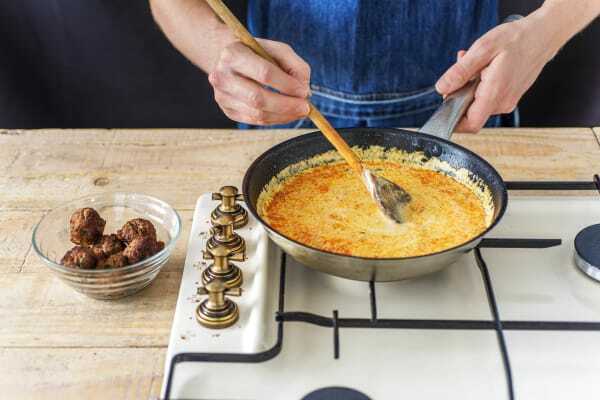 Stir together and cook on medium-low heat for 1 minute before adding the coconut milk. Mix in the remaining chicken stock pot and simmer for 5 mins. Add the koftas back in and gently simmer again to reduce the sauce slightly, another 3-4 mins. 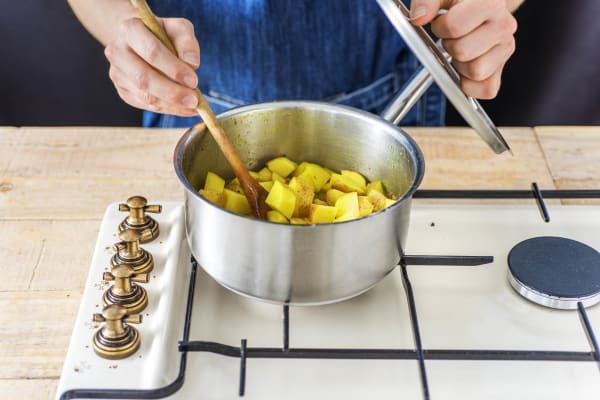 When the potato is cooked, take the lid off and allow the mixture to bubble away for a few minutes more, until the liquid has almost gone, stirring frequently to make sure it doesn't burn. Add the baby spinach, then take the pan off the heat, put the lid on and leave to the side for 5 mins. 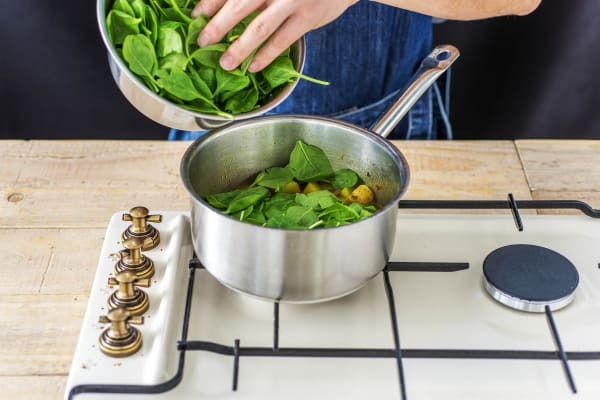 Stir through the spinach. This is your sag aloo! When the kofta curry has reduced slightly, squeeze over a little lime juice and stir it through. 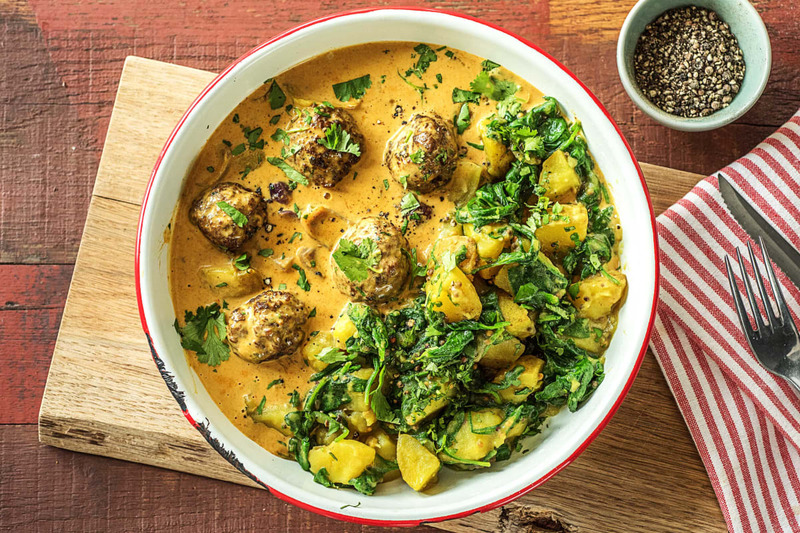 Serve the beef kofta curry sprinkled with the remaining coriander and the sag aloo on the side. Enjoy!